Have I ever told you guys that I’m like, the worst secret keeper in the world? Sure, when it comes to someone confiding in me about their secrets, I’m a lock-it-up-and-throw-away-the-key kind of girl. But the second I have a confidential tidbit of my own, you will find me either (a) giggling wide-eyed in the corner smiling like a crazy person until someone makes eye contact with me and I blurt it out immediately (b) physically covering my mouth with my hands in a futile attempt not to blab (c) taking out a billboard and plastering it with painfully obvious clues in an attempt to get people guessing or (d), all of the above. Which makes it so mind-blogging that I actually managed to keep a secret trip from y’all! That’s right. Alex in Wanderland’s fifth anniversary is fast approaching and I’ve shared pretty much every single step along the way with all of you – with one exception. In 2014, I took a clandestine trip that I never blogged. Until now. Today, I’ve partnered with Hawaiian Tropic® to share my secret sojourn – and announce the next one! You guys know Hawaii is my happy place, and I’ve gushed about my love for the fiftieth state over and over again here on this blog. What you don’t know is after I left Maui in 2014, I dipped over to Oahu for five days of 100% authentic Aloha Therapy. Even better? This October, I’m going back again! I’ve been waiting a long time for the perfect moment to share these happy memories with you. For me, visiting Hawaii is an experience of complete sensory overload, and I wish the same for every visitor to these amazing islands! Here’s what I got up to while visiting my dear friend and amazing ambassador of aloha, Wim, for the second time in she and her husband’s Oahu home – and some tips on how you can do the same. Go hiking • Feel the island beneath your feet! Yes, most travelers are drawn to Hawaii’s blue waters, but hikers know the green mountains are equally alluring. This hike to the summit of The Summit of Kea’au on Oahu’s West Coast was as stunning as it was exhilarating. I’m lucky that my local ohana knows secret spots like this, but there are plenty of well-marked trails for first time visitors to check out, too! Thanks for these last three photos, Wim! Go snorkeling • See the beauty of the underwater world! Did you know its illegal to visit Hawaii and not submerge yourself in its crystal shores? Okay, that’s not technically true, but you’d still be nuts not to add snorkeling – or scuba diving! — to your itinerary there. On this trip, Wim and I got our underwater fix by signing on for a snorkeling trip on the boat her husband works aboard out of Wai’anae. These trips are a little more-off-the-beaten-path than similar trips leaving from Waikiki or the South Coast, so you’re more likely to be the only boat in the bay. And there’s no better way to take in the scenery of the island’s West Coast! Kayaking • Smell the salty sea as you paddle across it! My favorite adventure of the trip found me fighting the current with a paddle in hand. Our destination? The twin islands of Moko Nui and Moko Iki, off the coast of Lanikai Beach. Several watersports shops in Kailua offer kayak rentals and can give advice on the day’s conditions. We called around for a good price and then strapped a double kayak right to the top of Wim’s car, but some shops are willing to drop your vessel right off on the sand if you don’t have your own wheels. Plan to spend about an hour round-trip paddling, wind and weather dependent, and of course allow plenty of time for island exploring once you reach your destination! Not sure you’re ready to tackle the challenge solo? 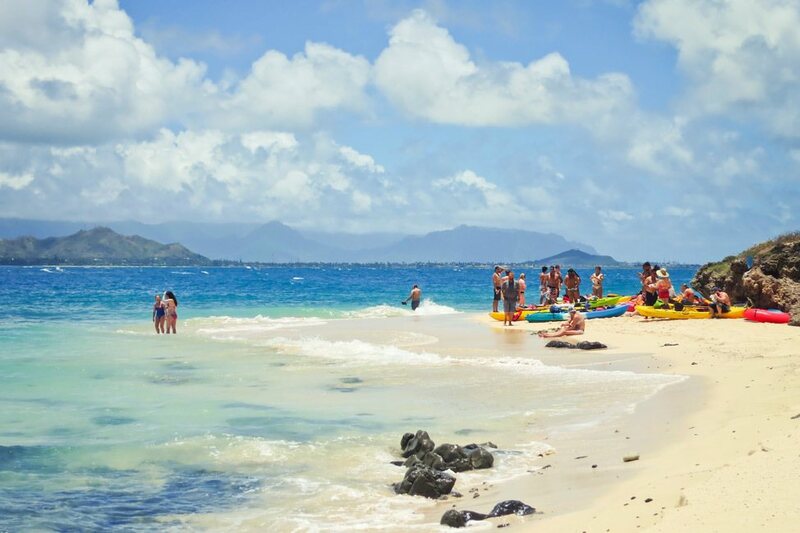 Various tour operators offer guided paddles out to the Mokulua Islands, as well. Keep in mind that there’s no shade on the way out or on the sand once you arrive – make sure your Hawaiian Tropic® Silk Hydration™ Weightless Sunscreen Lotion SPF 15 makes it into your beach bag! Beaching • Hear the sound of the waves crashing! Waikiki might get all the attention (and it certainly does deserve it!) 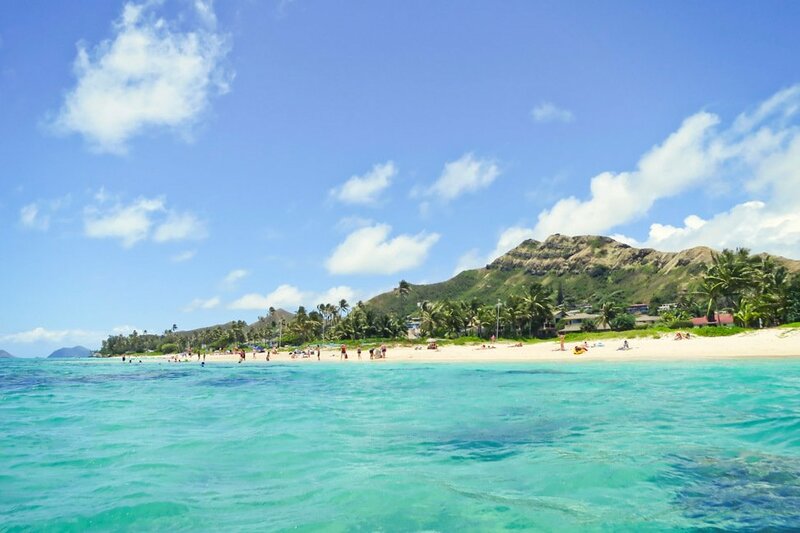 but Oahu allegedly has more than 125 beaches – don’t forget to explore a few more. My most memorable Oahu beach day was a simple trip to Ewa Beach with Wim’s two adorable dogs in tow. Can we talk about the size of these gentle giants? They were bigger than me! Want to have a spontaneous adventure of your own? Toss out the map and stop anytime you see a patch of sand! Island Exploring • Tasting the incredible flavors of Oahu! When we weren’t frolicking in Oahu’s great outdoors, we were browsing its cute shops and enjoying its amazing eateries. My favorite discovery of this trip was Cinnamon’s Café, an alleged favorite of the secret service and white house staff whenever Obama is on-island. Try the red velvet pancakes – you’ll thank me later. • Tan lines are for amateurs – slather on the SPF with Hawaiian Tropic® Silk Hydration™ Weightless Sunscreen Lotion in SPF 15 or 30 and keep your golden glow even and enviable. This bottle of goodness not only protects your precious skin but also goes on so lightweight you’ll forget you’re wearing it – until you’re home toasting your sunburn-free tan, that is! • If you end up going overboard on the outdoors and find yourself feeling a little pink, fear not – there’s plenty to do in Oahu that doesn’t require direct sun. Don’t hide in your hotel — slap on some Hawaiian Tropic® Silk Hydration™ After Sun Lotion, let its shea butter and aloe work their magic, and go explore! • Looking for a more complete packing list? Check out this post to see what I brought for ten days on the islands! And Now I’m Heading Back! Wim loves to joke that I’m her annual island visitor, but I’ve brought shame upon that title by not stepping foot on the islands in two full years. Which is to say that I’m wildly overdue for a return. This September, I’m righting that wrong. 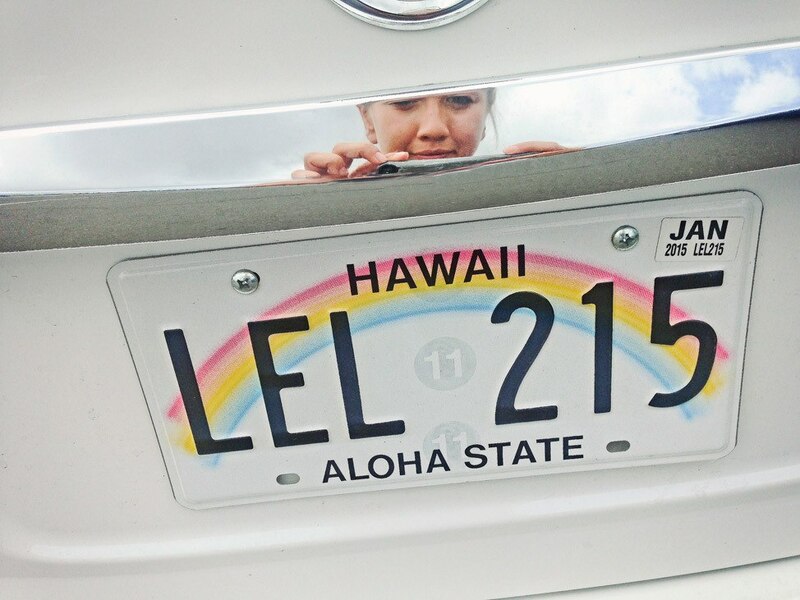 Aloha State, here I come! While the details are still up in the air, the plan is first head to Oahu for some urban exploring in Honolulu followed by some suburban bliss with Wim and her adorable new twin babies. Next, a stint in Maui to hunker down in Pa’ia for a few days followed by a road trip around Haleakala. There’s even a chance Big Island might get thrown into the mix too! Regular readers know how dear I hold this corner of the earth, and I’m simply beside myself at the thought of returning. I’m so excited to jump headfirst into planning. One thing’s for sure, I’ll be sure to keep you guys posted once plans firm up – mostly so I can ask for your brilliant advice, as usual. Want to get into those island vibes no matter where you’re headed this year? A dose of Aloha Therapy could be as close your nearest Walgreens. Get the sun protection you need while being transported to Oahu, Maui, or whichever island captures your tropical imagination! From June 5th through June 11th, Hawaiian Tropic® is Buy One Get One 50% off (excludes lip balm & trial sizes) at Walgreens. Limited quantities are available! Even better? Enter the #AlohaYourSenses social sweepstakes before June 11th, Win prize packs, Walgreens gift cards, and other summer essentials by entering below. Good luck and happy sun soaking! Do you guys love Hawaii and the aloha lifestyle as much as I do? Do you have any tips for my upcoming trip? Let me know in the comments! I have been compensated for my participation in the #AlohaYourSenses campaign, sponsored by Hawaiian Tropic® at Walgreens. As always, all opinions are my own.